Recommended for children 3 to 8, Don’t Ever Look Behind Door 32 is a silly, rhyming read that’s sure to please. I wasn’t quite sure what I was getting into when I picked this little picture book up. Would it be scary? Would the illustrations be creepy? Would the story be fun? The text and illustrations are incredibly kid-friendly, and while they seem to be building up to a big scary reveal – it all ends in a wonderfully silly way. The rhyming descriptions of the strange, silly, or weird things to be found in each room of the hotel are fun to read aloud and sure to inspire some giggles from the littles. Some of the illustrations are of monsters or goblins, but they are so colourful and full of smiles and funny antics, that they aren’t frightening at all. 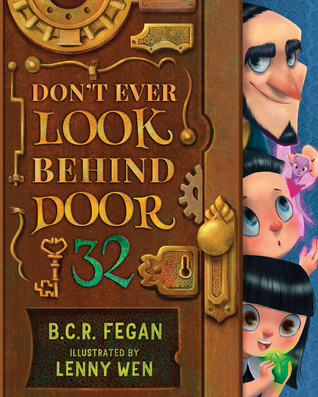 Don’t Ever Look Behind Door 32 is a fun, friendly picture book that builds up to a hilarious ending. If you could go to a magical hotel, what would you like to see inside?